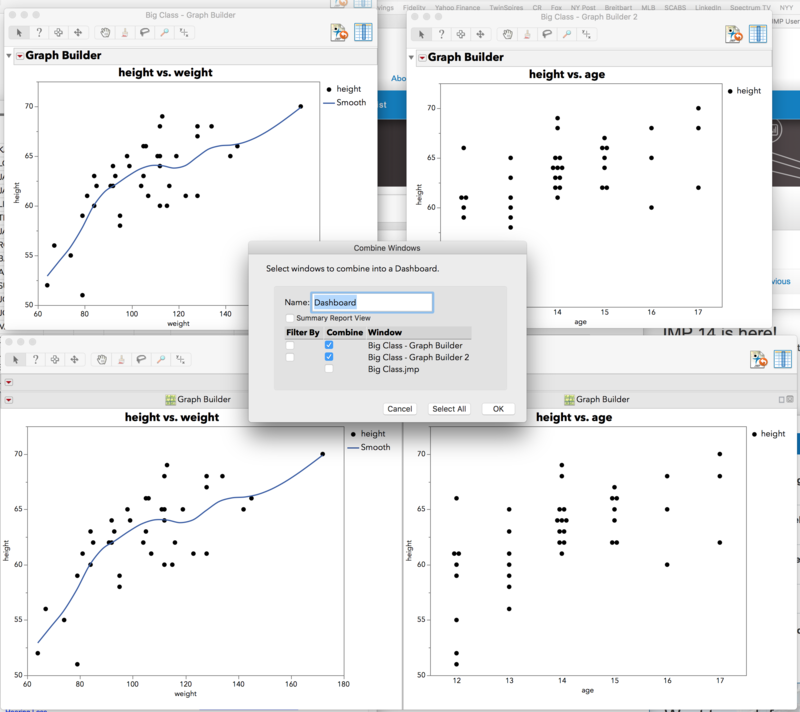 Combining 2 windows in Graph builder. I have 2 windows from graph builder.Is there a way to combine these 2 windows. "Combine selected windows" doesnt work with graph builder for some reason. Re: Combining 2 windows in Graph builder. Works for me...I created two graphs in graphbuilder and then used the Window>Combine windows capability. If you want to "combine" two graph builder graphs by overlaying one on the other, then you can do that by right-clicking in one graph, choosing Copy Frame Contents (under edit), and then Paste Frame Contents into the other graph builder window. Of course, if this is what you want, make sure that the graph windows are the same size with the same scales, etc. I just tested and had no problem combining two Graph Builder windows. Can you provide some more information about how the combine windows isn't working? Do you receive error messages? I had a tabulate function.Took that ou and now able to combine 2 windows.